Air traffic controllers give pilots takeoff instructions. They also manage separation between landing and departing planes. (CNN) -- Ron Connolly sometimes had to function on four hours of sleep or less when he worked as an air traffic controller. He remembers going to work exhausted and not getting enough rest between shifts, which sometimes ended and began on the same day. "I used to feel that I was so tired that I actually felt sore," said Connolly, who retired two years ago after working for more than a decade at Charleston International Airport in South Carolina. "It was very difficult to stay awake, extremely difficult," he said recalling his time on the overnight shift when he was usually the only one on duty. So Connolly said he was not surprised by the recent revelations that several air traffic controllers have fallen asleep on the job this year -- a trend that U.S. Transportation Secretary Ray LaHood called "absolutely unacceptable." The Federal Aviation Administration said it will assign an extra air traffic controller on the midnight shift at 27 control towers that have been staffed with only one person during those hours to help combat the problem. Meanwhile, Hank Krakowski, the FAA official in charge of operating the air traffic control system, resigned on April 14. The recent reports may be disturbing to the public, but people who know the realities of the high-pressure profession said sleeping on the job has been happening for a long time. "This is nothing new," said Bob Richards, a retired air traffic controller who worked at Chicago's O'Hare International Airport for 22 years and wrote the book "Secrets From the Tower." "I think inside the profession, everybody knows this goes on." It's a profession that's also in transition. There are 15,475 air traffic controllers, according to the FAA. About 27% of them were trainees in 2009, a peak created by the hire of thousands of new controllers in the last few years to prepare for a wave of retirements. Many workers who came on board in 1981 after President Ronald Reagan famously fired striking controllers are now getting ready to leave the job. The percentage of trainees declined in 2010 and is expected to continue to drop, according to the FAA's latest air traffic control work-force plan, which stretches from 2011 to 2020. Staffing is still ahead of traffic, according to the plan. Systemwide air traffic is down 22% since 2000, and controller head count is slightly higher than it was that year. 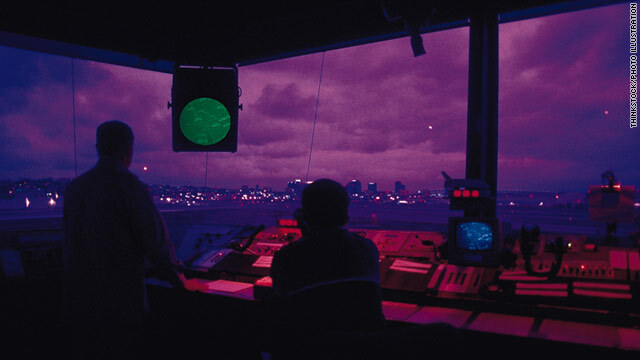 A sweeping overhaul of the air traffic control system, expected to take at least a decade, should create a more automated system and change the role of air traffic controllers. The FAA is still determining how the overhaul, referred to as NextGen, will affect controllers, and the 2011 plan does not factor the changes into forecasting staffing needs. But what's life like now for the people responsible for the safety of aircraft and the passengers? They get paid well: The average annual salary for air traffic controllers was $109,000 in 2009, the latest figures available from the U.S. Bureau of Labor Statistics. But stress is always part of the job as controllers have the awesome responsibility of juggling various planes landing, taxiing and taking off at the airport. "You can have an extremely intense day, where you can actually hear your heart pounding in your ears while you're working," Connolly said. The schedule can be tough, too. Controllers typically work five eight-hour shifts per week, according to the FAA. Shifts vary, but might include a couple of day shifts, followed by a swing shift and a night shift. Controllers used to be required to have at least eight hours of rest between shifts, but the government raised that minimum to nine hours on April 17. Many facilities are closed at night, but 22% of the work force did at least one shift that encompassed midnight in 2010, the agency said. The exact schedule depends on the airport, but Richards said a typical workweek begins with two days on an evening shift -- likely 3 to 11 p.m. -- immediately followed by two days on a morning shift -- from 7 a.m. to 3 p.m. A controller then will typically have to come back just hours later to finish the week with one overnight shift, likely from 11 p.m. to 7 a.m. It's done this way so that controllers can deal with both busy and slow air traffic periods, Richards said. Mornings and evenings tend to be the busiest as people depart for and return from business trips. The overnight shift is the least busy. "People have (said) things like, 'Well, why don't we just all work straight day shifts or straight night shifts?' But you end up then not distributing the workload," Richards said. "You have some people who are working all the heavy traffic all the time and other people working hardly any traffic, and that doesn't make for good controllers, in terms of keeping up the proficiency." But the turnaround times for such shifts can be brutal. Connolly remembers sometimes having just eight or nine hours between the time one shift ended and another one started. The transition from the day shift, which at his airport ended at 2 p.m., to overnight, which began at 11 that evening, was particularly difficult. "Many times I just couldn't go to sleep. Here it is, I've gotten off at 2 o'clock. It's broad daylight. The family is active; they're asking me things that need to get done," Connolly said. Research shows that air traffic controllers get an average of 2.3 hours of sleep before an overnight shift, according to the American Academy of Sleep Medicine. Once Connolly began the shift, it was hard not to get drowsy. It's unnatural for humans to be nocturnal, experts say. Humans are wired to sleep at night by their circadian rhythm, a 24-hour cycle that brings about physical, mental and behavioral changes in the body. The circadian rhythm affects sleep cycles, hormone releases, body temperature and various processes. "All shift workers get sleepy," said Jeanne Geiger-Brown, an associate professor at the University of Maryland School of Nursing who researches shift work and sleep. "Twenty percent of workers doze off during night shift. People aren't machines." The biggest issue is not air traffic controllers falling asleep, but working while impaired by fatigue, said Bill Voss, president and CEO of the nonprofit Flight Safety Foundation. If a pilot says he is too tired to fly, for example, he is allowed to decline the flight without being punished, Voss said. But there's no provision for an air traffic controller to call in fatigued. "That's actually illegal, and they have to be punished. So in one way, you are forcing people to work even if they can't," Voss said. Meanwhile, air traffic controller staffing continues to be under extreme scrutiny. The FAA said Randy Babbitt, the agency's administrator, and National Air Traffic Controllers Association President Paul Rinaldi have launched a nationwide 'Call to Action' on air traffic control safety and professionalism" and are visiting air traffic facilities to underscore those points. CNN's Madison Park and Marnie Hunter contributed to this report.